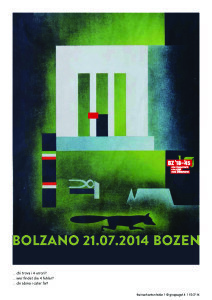 BZ ’18-’45 was inaugurated on July 21, 2014 in the presence of the Italian minister of culture Dario Franceschini. 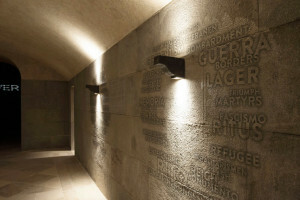 Built around the crypt that lies beneath Marcello Piacentini’s 1926-1928 Monument to Victory, it consists in a center documenting the turbulent history of Bolzano and the Alto Adige region between the ends of World War I and World War II. 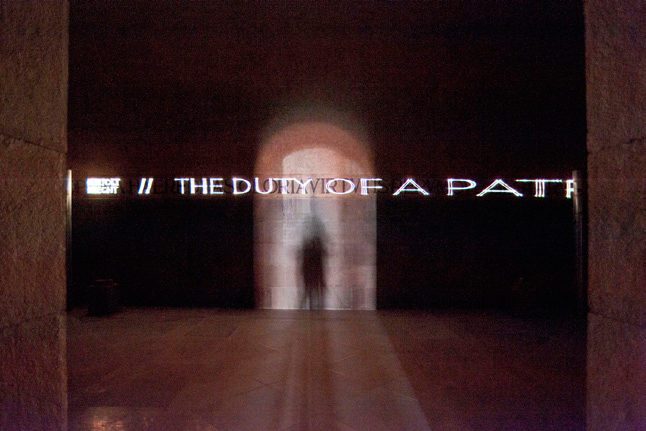 BZ ’18-’45‘s subtitle is: one monument / one city / two dictatorships (see the gif below crafted by my collaborators at Gruppe Gut Gestaltung). The documentation center’s historical rooms are 15 in number. 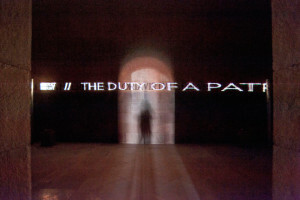 They are preceded by two immersive environments: an entryway in which ghostly wreaths of historical keywords in German, Italian, and English dialogue with a no less spectral acoustical backdrop made up of electronically remixed archival sounds; and the empty crypt itself, complete with its original frescos by Guido Cadorin and Latin inscriptions from Cicero and Horace placed in the service of fascism’s civic religion of nationalism, here reinterpreted “dialectically” by means of a sensor-activated system that superimposes counter-quotations by the likes of Hannah Arendt and Thomas Paine over their Roman predecessors. 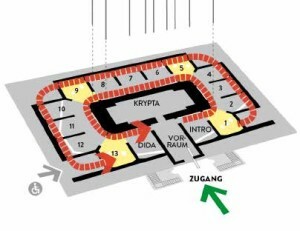 There are two intertwined routes around the historical rooms that radiate outward around the crypt. Both are chronological in sequence. An “internal” route reconstructs the (micro)history of how the Monument to Victory was built. An “external” route runs along the outer periphery and documents the key events and transformations of the years between 1918 and 1945, the region’s macro-history. 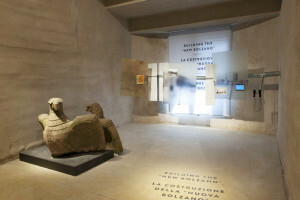 Four corner rooms confront overall questions such as: What is a modern monument? What are the elements that compose the Monument to Victory? Who was Marcello Piacentini? 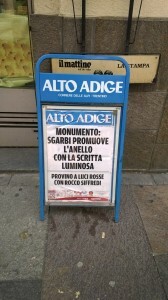 And what exactly do we as citizens demand of monuments today? 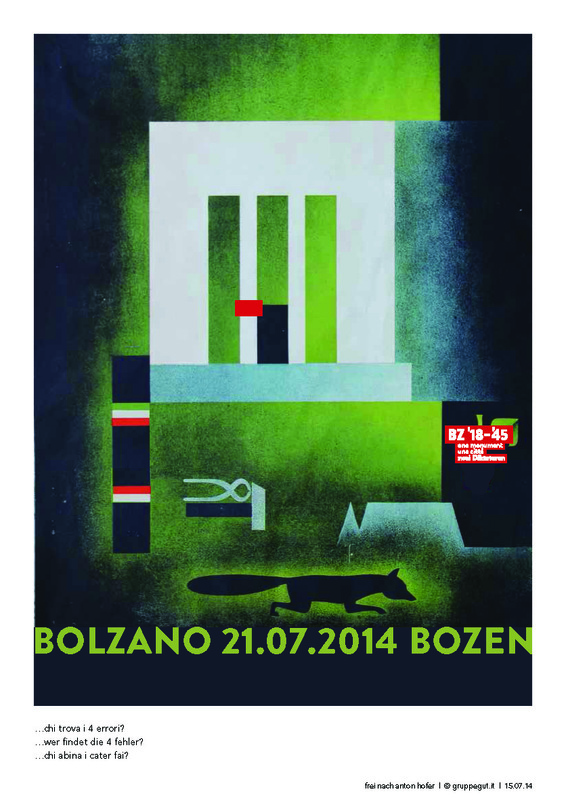 Funded by various public entities, BZ ’18-’45 represents an exemplary effort to reintegrate a controversial monument, that has long served as the focal point of battles over politics, culture, and regional identity, into the fabric of contemporary Bolzano. It was carried out through the collaborative efforts of a talented team of historians, archivists, designers, and producers (on which I had the honor of serving as chief consulting curator and scientific advisor). The team included Andrea di Michele, Hannes Obermair, Christine Roilo, Ugo Soragni, Silvia Spada, and our terrific collaborators from Gruppe Gut Gestaltung: Alfons Demetz, Uli Prugger, and Werner Stampfer, who, among their many contributions, first developed the concept of the LED ring (see below). The controversy surrounding the Monument to Victory serves as the fulcrum of the visitor experience that my colleagues and I designed for BZ ’18-’45. 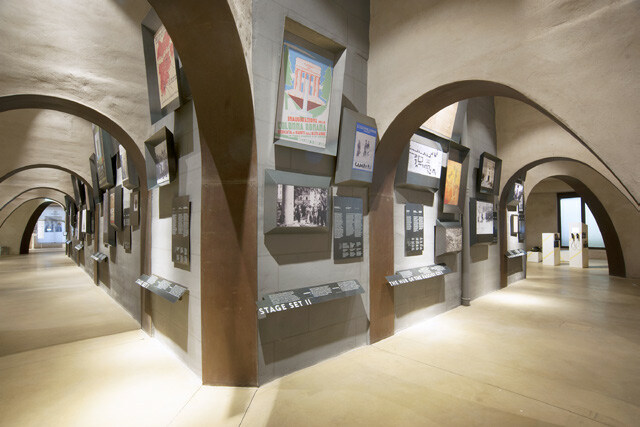 Even for visitors who know little about modern Italian history, the controversy becomes readily understandable, at once legible and visible. 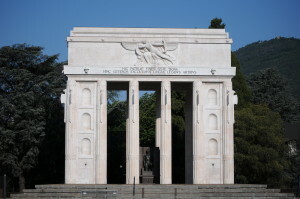 Piacentini’s Monument was built at the direct behest of Mussolini, displacing an Austrian monument to the Austrian war dead erected on the same site. In a very real sense, it stands as the founding fascist monument, making inaugural use of a new columnar order–the lictorial column–that became pervasive in later fascist architecture. Planted like a stake in the heart of the capital of a newly conquered region, it commemorated Italy’s victory in World War I over Austro-Hungary in imperial terms. One of the two Latin inscriptions on its pediment, crafted by the Latinist Ettore Paratore, read: “Here at the fatherland’s border, plant the banners! From here we enlighten others with language, law, and the arts”; (the “others” in question were at once the local German-speaking population and the Germanic peoples to the north). Busts of the “martyrs” of Italian irredentism Cesare Battisti, Damiano Chiesa, and Fabio Filzi, accompanied by Libero Andreotti’s resurgent Christ, sit atop the main platform. The Monument to Victory is a monument with an attitude. A documentation center (and not a museum), BZ ’18-’45 lurks humbly and invisibly beneath the monument’s imposing masses of white marble and gray granite… with one exception. 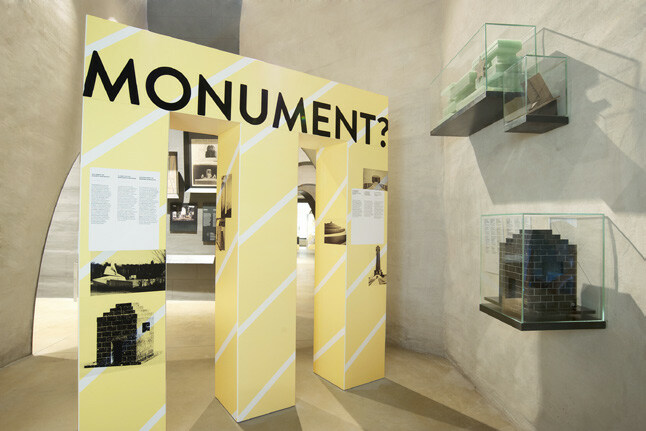 From the outset, the design team sought to render its presence visible to the public through a modification of the monument itself that is fundamental to the project’s overall drive to recontextualize, reframe, and alter the monument’s meaning. The modification in question is simple: to attach a three-banded LED ring, a kinetic wedding band, to the third column from the right of the monument’s façade which faces the Talvera Bridge and the city center. Yes, the ring in question serves as a billboard for BZ ’18-’45 and public address system. But there’s a deeper function, at once aesthetic and symbolic: to unbalance the façade with its neoclassical symmetries–not to mention, the ideology embedded within those neoclassical symmetries–in the name of post-fascist-era balance. The LED ring marks the difference between the totalitarian then of the monument’s construction and a now characterized by cultural pluralism and tolerance. 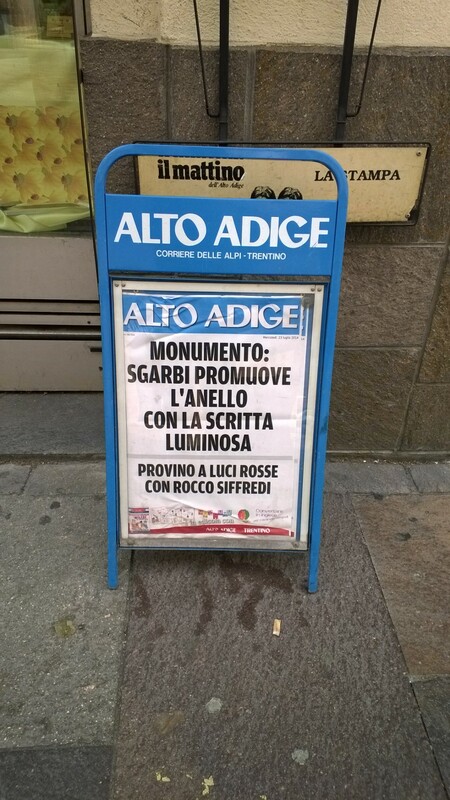 In so doing, it re-weds the monument to the city of Bolzano at the very site where, on the 18th of December, 1935, the “day of the wedding band” (giornata della fede) local women traded their golden wedding bands for state-supplied iron ones in support of Mussolini’s colonial adventures. In short, by unbalancing, the ring rebalances; by defamiliarizing, it refamiliarizes. It performs a symbolic reversal that gives a state monument (and the history that it stands for) back to the local citizenry and renders visitable a site that has been fenced off for over a half-century. 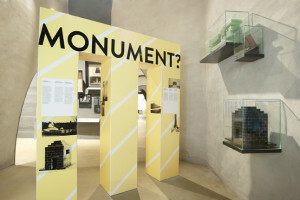 In devising this intervention, my collaborators and I were well aware that preservationists on the right, center, and left (irrespective of whether they believe that the Monument to Victory is a significant piece of 1920s architecture–most don’t) would rise up at the time of BZ ’18-’45‘s inauguration to criticize a gesture that breaks with the norms that are conventionally applied to the restoration of historical monuments. We believe that they are wrong and ask them to stretch their minds before leaping to negative judgments, not to mention issuing hasty calls for the ring’s removal. We also ask them to be aware that, subversive or not, the gesture in question was informed by a sustained, well-informed, critical, and creative engagement with the stuff of history. A philological note: the placement of the LED ring over the sculptural representation of the band that occurs on the lower third of the each lictorial column is symbolically significant. In antiquity the fasces was a key symbol of imperium with the rods that make it up sometimes understood as peoples, the red leather band as the force of Roman law or the Roman state, and the single-headed axe as the icon of the magistrate’s powers of decision over the life and death of citizens. BZ ’18-’45 replaces the Roman band with a dynamic, ever changing band, whose law is not the eternal power of the state over its citizens but rather the power of citizens over the state in shaping a public sphere defined by participation and perpetual change. Two favorable press reviews: Maxi Obexer, “Das war Überfällig,” TAZ. 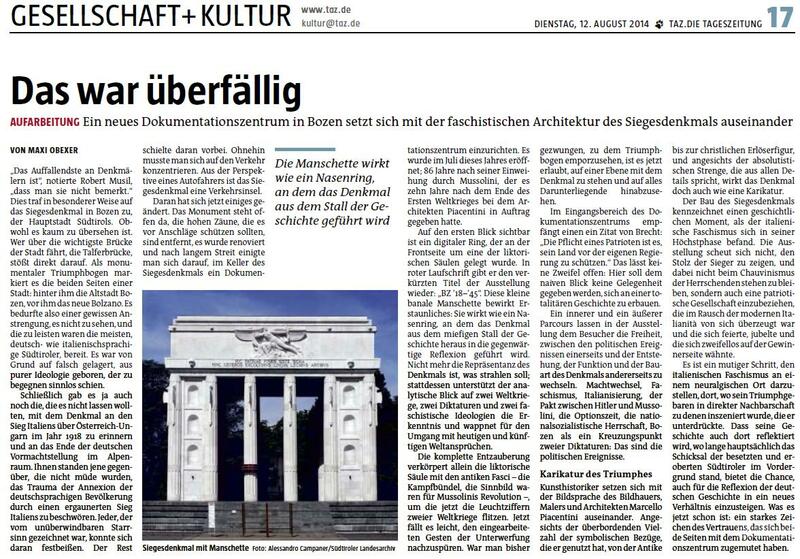 Die Tageszeitung (Berlin), Aug. 12, 2014; and Elfi Reiter, “Un abbecedario in marmo del fascismo,” Il Manifesto, Aug. 9, 2014.